Two more former Catalan ministers, Joaquim Forn and Josep Rull, currently in pre-trial detention, have joined a hunger strike to protest against the judicial process of the pro-independence leaders, due to start in early 2019. 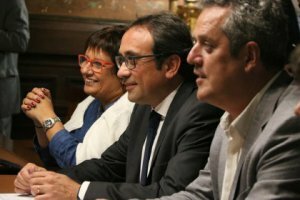 Forn and Rull have joined former minister Jordi Turull and former activist and now MP Jordi Sànchez, who are now on their third day without any food. Four out of the nine jailed leaders are now on the hunger strike. Josep Rull, who was previously minister of infrastructures, spent a month in jail in 2017 and entered pre-trial prison again in March this year. Joaquim Forn, the former Catalan interior minister, has been in pre-trial jail for more than a year. ‘We announce that we are joining the peaceful protest that our colleagues, Jordi Sanchez and Jordi Turull, have already started,’ read a statement issued by them. ‘Neither our protest nor that of our colleagues is a hunger strike to ask for any treatment of favour or positive discrimination,’ Rull and Forn said in their statement. The lawyers of the politicians have explained that they want to highlight their claim that Spain’s Constitutional Court is ‘blocking’ their cases reaching the European Court of Humans Rights (ECHR) by delaying decisions on their appeals. The European Court of Human Rights only accepts for consideration cases which have gone through the whole national judicial path. Spain’s Prime Minister Pedro Sánchez has already stated that the hunger strike is not justified because the rights of the jailed Catalan leaders are being respected. ‘I think it is important to stress that they will have a fair trial because we live in a society based on the rule of law and the judiciary is independent,’ he told reporters during a press conference at the end of the recent G20 summit in Buenos Aires. Joaquim Forn, a fomer Home Affairs minister, has been in pre-trial jail for more than a year. Josep Rull, who was minister of Territory, spent a month in jail in 2017 and entered pre-trial prison again in March last year.